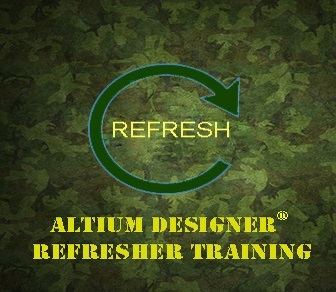 This class is designed to provide a 2-day (12 hours total, 6 hours per day) refresher training with Altium Designer Version 17 (AD17) for engineers and designers who don't use Altium Designer on a consistent basis due to the nature of their jobs. The class focuses on the areas where lack of familiarity with the tool will impede the design flow. Note that this class should only be taken after attending the Altium Designer Boot Camp offered by Nine Dot Connects or has prior experience of design, layout and manufacturing of a PCB using Altium Designer. Navigation of Altium Designer- This section will acquaint the student with the features of the AD17 environment, including workspace panels and the ability to navigate within the schematic, schematic library, PCB, and footprint library editors. It will also review the format and extensions of the PCB project in the Projects panel. Schematic Entry - Schematic entry basics will be reviewed, including best practices and helpful search techniques to assist in quickly finding components that Altium makes available. ECO Process – This section will focus on the Engineering Change Order (ECO) process of "compiling" the schematics and resolving any Electrical Rule checker (ERC) errors or warnings. The ECO process and its configuration options will also be discussed. PCB Routing - A thorough review of the routing capability within the PCB layout editor. Documentation - This section will focus on configuring the .Outjob file for automating and generating key documents expected by the fabricators and assemblers.